All the holes and cracks in the wall have been properly plastered by the painter. The painter sanded between each paint coat. The edging lines are straight. The new paint completely covers the original paint. The painter left everything clean, and there is not even one drop of paint on the floor. 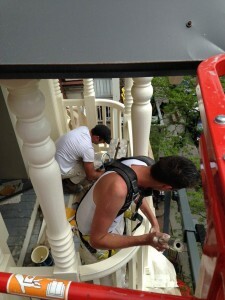 The painter suggested a pressure washing on the surface to increase the adherence, if needed. The edge lines are straight. The chosen paint is adapted to the surface. An anticorrosive treatment was performed on the metal and aluminium surfaces such as lintels and wrought iron stairs. For painting at heights tasks, the entrepreneur painter was secured safely, or he used a safe elevator platform that prevented him from falling. There are no paint drops in the grass, on your car or on the neighbor’s house! Moreover, a good house painter should offer warrantees on his work. These should be clearly indicated in a detailed contract that is signed by both parties. To see the warrantees normally offered by Findecor, please refer to our Painting Services. What can you do when you are not satisfied with your house painter services? If you are not satisfied with the services of the painter you hired, no matter if it’s for the painting of a house or of a store, you always have the possibility to make a complaint to the Régie du Bâtiment du Québec (RBQ) by completing this form. Please note that it’s also possible to report them unlicensed work. It’s also possible to file a complaint to the CCQ. All painters working in the province of Quebec are in the obligation to have their CCQ cards to have a right to proceed with commercial painting contracts. The CCQ card is a work licence that proves the painter’s abilities. Did you know? A painter which does not have his CCQ card who works on a commercial building is probably working under the table. In this case, it’s important to denounce him so that he does not do poor quality work for other stores in Montreal. You just have to fill in this form. Does this apply to private/ residential painting also?